Located at the juncture of three very different nations, the city of Tredroy has evolved an identity all its own. It's a place of sophistication, trade, diplomatic intrigue . . . and sometimes knives in the night. It's a place where everyday behavior on the West Bank can be a serious offense on the East, and your only hope for freedom might be a dash across the hundred-yard bridge! From brawling docksides to Council chambers, from wizards' workrooms to wealthy Guildhalls, here is a complete city that will add spice to any fantasy campaign. Tredroy includes places to visit, people to meet, customs, economics, politics, and a short adventure. Tredroy was designed for use with the GURPS Basic Set. 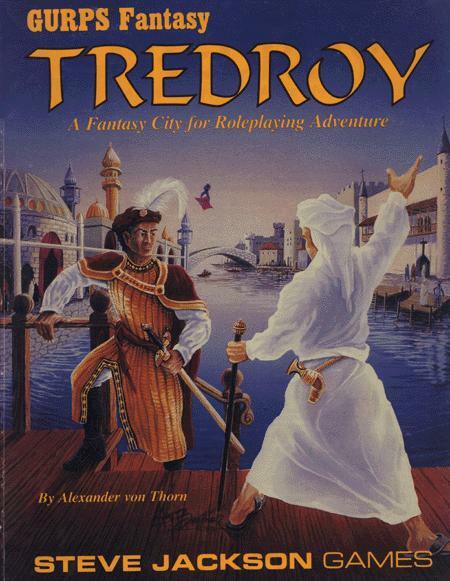 Nothing else is required, but since Tredroy is set in the world of Yrth, it fits seamlessly with GURPS Fantasy, GURPS Magic and GURPS Grimoire. Or it can easily be adapted to any fantasy background and roleplaying system. You can also use this supplement with the Fourth Edition worldbook for Yrth, GURPS Banestorm. Welcome to the City of Three Laws. Be careful . . .
GURPS Fantasy – The complete GURPS Third Edition sourcebook for the magical realm of Yrth. For GURPS Fourth Edition stats on Tredroy (plus information on how to use that information), check out GURPS City Stats.